Objective: To further the child's understanding of sin and his/her need for God. What is the man's name in our Bible story? How much did Nicodemus know about God? Can Nicodemus get to heaven by himself or by doing nice things? Bible Verse: Romans 10:9 (NIV) - If you declare with your mouth, "Jesus is Lord," and believe in your heart that God raised Him from the dead, you will be saved. Romans ten-, verse nine, declare, believe. - Nicodemus was a good man but did not understand God. He came to Jesus to find out more. Jesus told him about God and how to go to heaven. Jesus says, "You must be born again." Nicodemus was confused because he didn't understand how he could become a baby again. To be born again means to be forgiven of your sins and be made new again by the Holy Spirit. Jesus explained that Nicodemus can not get to heaven by himself but he can go to heaven if he believes in Jesus.Salvation means to be saved from something. Biblically, salvation means to be saved from death. - Color the Nicodemus worksheet with chalk. Do you like to receive gifts? I sure do. It is fun to receive a gift and see what is inside. Inside this gift is the most wonderful present you will ever receive. Would you like this gift? Oh, I am sorry but there is a huge problem. You can't touch this present. You can't touch it because there is an invisible, huge wall in the way. A wall so big that you can't climb over it, you can't go around it, and you can't crawl under it. And, what the wall is filled with is so thick and gross that you can't break through it. What is sin? Sin is the bad choices in our lives. These bad choices mean that we have disobeyed God. Sin is anything that we do, think, or say that makes God sad. Romans 3:23 says that we have all sinned and are unable to come close to God. It is this sin that is keeping us from getting to the gift. If you can't climb over, go around, crawl under, or go through, how do we get to the gift? (Allow the child to share.) Actually, there is nothing we can do. We can't be good enough and we can't do enough good things to break down the wall. The Bible says in Romans 6:23 that because of our bad choices death must happen to pay for the sin in our life. So, do you still want the gift? All you have to do to receive the gift is to admit what you have done wrong, believe that Jesus died on the cross as a substitute for you, and then choose to follow God the rest of your life! Remember that I told you this gift is the most wonderful present you will ever receive? Do you want to know what is in the gift? Let's look. (Have a child unwrap the gift to find a cross.) Do you know what this cross means? Because Jesus died on the cross to pay the punishment for our sins and then rose again, we can have eternal life. The gift is eternal life. This means that you are part of God's family and will live with Him forever. But God won't force you to take the gift. You must choose to take it by removing the wall between you and God. Remember how to do this? A - Admit what you have done wrong and ask forgiveness. B - Believe that Jesus died on the cross as a substitute for you. C - Choose to allow God to be in charge of your life. Being God's child and living with Him forever is definitely the best gift you can ever choose to receive. If you would like to receive this gift, please come talk to me and I will help you. 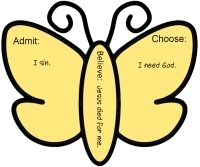 On the ABC Butterfly have the child write: Admit – I sin. Believe – Jesus died for me. Choose – I need God. Cut out the butterfly pieces. Glue the pieces together on a piece of construction paper. Decorate. - Every five-year-old child is in a different place when it comes to his/her understanding of sin and his/her need of Jesus. The objective of this lesson is to further the child's understanding. But never try to scare a child into a decision. Let the child take the lead. Until that time comes, continue to pray and plant seeds! Write 1 + 1 = 2 on a piece of paper. Lay one block (or item) above each "1" and two blocks (or items) above the "2." Explain that the "+" means that the two numbers around it are being added or combined together. The "=" means that both sides are the same or equal. - Living things eat, grow or change, reproduce (produce more of their kind), move. Nonliving things do not. - Create a chart of living and nonliving things using pictures of various things or toy-sized items. - Instruct the child to draw pictures representing each of the categories of living things on the People are Living Too worksheet. - On the United States map, color states that you have visited. Write names of family and friends that live in other states. - Google your country to find out history and information. Make fireworks by making small circles of glue on a piece of paper. Off of the circle, add "arms" to look like fireworks bursting in the air. Sprinkle with glitter. Discuss that fireworks are used to celebrate the Independence Day of the United States. Fireworks are used for very special occasions and July 4th is an extra special day. The phrase "bombs bursting in air" is part of the Star Spangled Banner. Writing a few a day, write the lowercase letters on the ABC Lowercase Letter worksheet. Available in the ABCJLM Handwriting Workbook. Lay a pile of 40 M&M's on the table. Have the child write the name of each color on the bottom of the M&M Graphing worksheet (red, blue, green, yellow, brown, orange). Write the numbers 1-15 up the left hand column. Sort the M&M's by color. Start with one color and count the number of M&M's in that pile. Show the child how to graph the number of M&M's. 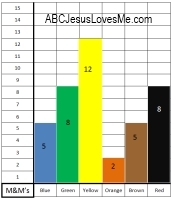 When finished, write the total number of each color on the graph. Then count the total on the graph to make sure 40 M&M's are accounted for. Click to view an example image. For the last 33 weeks, your child has learned the basics of literacy from the outside to the inside of a book. Now it is time for your child to create her own book with a cover, storyline, and illustrations. Review the importance of characters, setting, main events. Help the child decide whether to write a fiction or nonfiction book. To get started, review the various items of literacy with A Pocket Full of Kisses. - Cut the Raccoon Puppet worksheet. Color and glue to a lunch size paper bag. 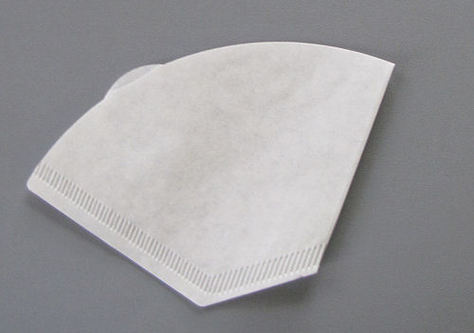 - Using a Cone Coffee Filter, staple a handle and fill with kisses to give to others. Pragmatics is the study of language in a social setting. Included in the 5 Year Curriculum are suggestions to help a child use language appropriately in social situations. Select one or more of the example pages to discuss.